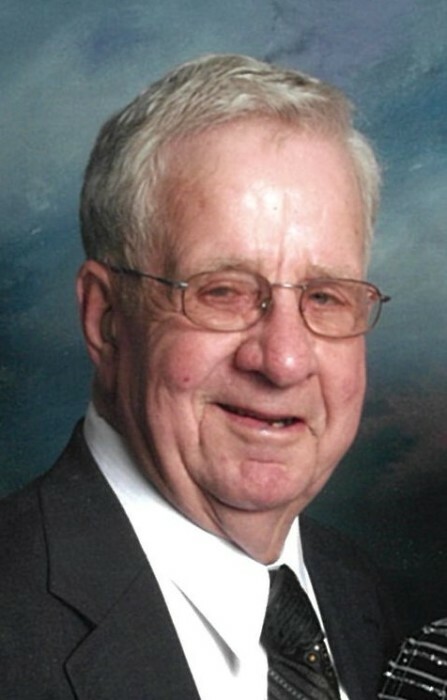 George W. Solander, age 92, of Flat Rock passed away Saturday October 6, 2018 at his residence. He was born July 31, 1926 in Flat Rock the son of the late Clyde & Kathryn (Swartz) Solander. George was the postmaster in Flat Rock from 1968 – 1991 and ran the Swartz and Solander General Store in Flat Rock. He graduated from Heidelberg College and served in the US Army in the Pacific Theater during WWII. He was a member of Immaculate Conception Church, Bellevue VFW & American Legion, K of C; 4th degree, Kiwanis Club, National league of Post Masters, and National Association of Post Masters. He volunteered at the Bellevue Hospital and Bellevue Fish and Loaves. Survivors include his wife, Marjorie (Friend) Solander whom he married October 6, 1951 in Bellevue; son, George (Rebecca) Solander of Sycamore, daughter, Margaret “Peggy” Marshall of Phoenix, AZ, grandchildren, C. Lance Marshall & Kathryn Marshall both of Phoenix, AZ, and his brother Clyde Solander of Fremont. In addition to his parents he was preceded in death by his daughter, Amy Solander and an infant son. Friends will be received Tuesday, October 9, 2018 from 4 – 8 pm at Foos and Foos Funeral Service, 151 Yorkshire Place, Bellevue. The Rosary will be recited Tuesday at 3:30 pm. A funeral Mass will be celebrated Wednesday, October 10, 2018, 11 am at Immaculate Conception Church, 231 E. Center St., Bellevue. Burial will follow at Bellevue Catholic Cemetery with military honors.